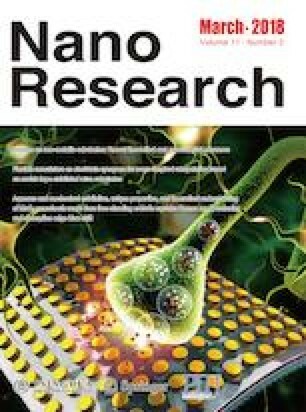 Hierarchical nano-architectures comprised of ultrathin ternary selenide (CoNiSe2) nanorods were directly grown on nickel foam (NF). 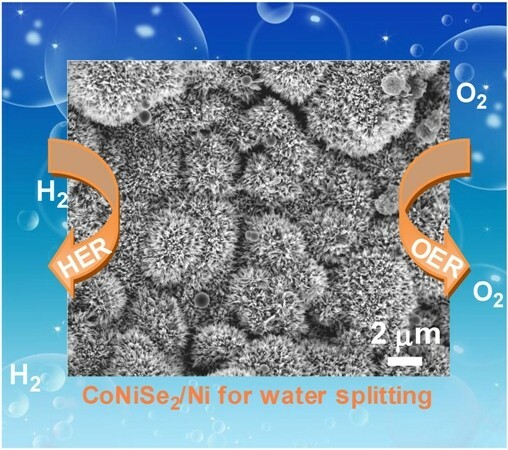 The integrated CoNiSe2/NF functions as a robust electrocatalyst with an extremely high activity and stability for emerging renewable energy technologies, and electrochemical oxygen and hydrogen evolution reactions (OER and HER, respectively). The overpotentials required to deliver a current density of 100 mA·cm−2 are as low as 307 and 170 mV for the OER and HER, respectively; therefore, the obtained CoNiSe2 is among the most promising earth-abundant catalysts for water splitting. Furthermore, our synthetic sample validates a two-electrode electrolyzer for reducing the cell voltage in the full water splitting reaction to 1.591 V to achieve a current density of 10 mA·cm−2, which offers a novel, inexpensive, integrated selenide/NF electrode for electrocatalytic applications. Supplementary material (additional characterization results and electrochemical data for this article) is available in the online version of this article at https://doi.org/10.1007/s12274-017-1748-3. This work was financially supported by the National Natural Science Foundation of China (NSFC) (No. 21371097) and the Key University Science Research Project of Jiangsu Province (No. 16KJA150004). Supplementary material, approximately 40.0 MB. Supplementary material, approximately 5.7 MB. Supplementary material, approximately 5.47 MB.